However, this is only the latest hitch from a long list of problems in bilateral relations. It would be fair to say that Italy and France have always regarded each other as rivals. Whether it be political or private, this rivalry is raging at all levels. Typical examples here are who owns the Mont Blanc (Monte Bianco) summit and whose wines are better. Politically, Franco-Italian rivalry in the Mediterranean is a major problem. The Mediterranean is a foreign policy priority for both states, but Italy has been recently losing this battle to France. The latest example is Libya, where Italy was against a military operation up to the last possible moment. Rome’s interests have been seriously affected by instability in the region, in particular in Libya. Besides, France and Italy are fighting for EU leadership. 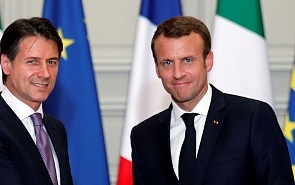 One of Italy’s objective interests is to join the Franco-German duo and give the European project a new lease on life. The Italian government also wants the other European countries to respect its interests. There were periods of mutual accord between Italy and France. Alcide De Gasperi, the 30th Prime Minister of Italy and the founder of the Christian Democracy party, and Robert Schuman, twice Prime Minister of France and a Foreign Minister, understood each other not only because both spoke German, but also because both dreamed of a united Europe without strife and wars. The current conduct of Salvini and Di Maio can be interpreted as the scream of the enfant terrible and a desire to prove that Italy has its own, independent position. The previous Italian governments used conventional methods to uphold Italy’s national interests. Di Maio is a newcomer on the political stage and hence has no historical links to Italy’s political establishment. Salvini has attracted public attention several times by his hardline statements together with shocking behavior, such as drinking Guinness in parliament when Ireland rejected the Lisbon Treaty in the first referendum. Some of his actions pushed Italy very close to the red line. On the other hand, the current differences between France and Italy, even though they can develop into confrontation, are largely a reflection of a collective memory and a shared history. Suffice it to say that Napoleon was crowned the King of Italy, and that Italians fought for their independence against the Franco-Austrian Alliance. The Kingdom of Sardinia conquered Lombardy thanks to the French victory at Solferino, while the Kingdom of Italy captured Rome following the surrender of Napoleon and his army at the Battle of Sedan. Long after Italy regained independence and completed the period of unification, France established the protectorate of Tunisia 1881 and launched a policy of discrimination against Italians, who made up Tunisia’s largest and most influential community. In the subsequent period of time, French cartoonists ridiculed Prime Minister Crispi. For example, one caricature portrayed Crispi kneeling in servility before German Chancellor Otto von Bismarck, who is trying out the Italian boot. Crispi responded by declaring the tariff war on France. France and Italy also have a few unsettled territorial disputes. For example, the Italian followers of irredentism declare the goal of “liberating” Nice and Corsica from France. When Muammar Gaddafi came to power in 1969, he forced the Italian colonists and their descendants to go away from Libya. France was the first country to deliver combat aircraft to the new Libyan leader. When G5 was established, Italy was denied entry, largely because of France’s position. Italy joined the group, which was renamed G6, only thanks to US mediation. When France was a democratic republic, Italy was a conservative monarchy. When France was fighting the stress after losing the war to Bismarck’s Prussia, Italy was Germany’s ally. When Italy was fighting in Libya in 1912, the Italian government, fearing that France would help Libyans, seized French vessels in the Mediterranean. The problem was later settled in the International Court of Justice at The Hague in France’s favor. The current developments in Italy have shown that the country does not have any common center of power or coordinated position, as can be perceived from the Italian political leaders’ actions after Juan Guaido usurped power in Venezuela. Who is the de facto national leader? As the saying goes, it takes two to tango. To succeed, the couple must be closely knit, have a coordinated position and complement each other. This is what is lacking in Italy, as well as Europe as a whole. Politically, Franco-Italian rivalry in the Mediterranean is a major problem. The Mediterranean is a foreign policy priority for both states, but Italy has been recently losing this battle to France.